Sergio Perez knows he is on notice at McLaren. After Martin Whitmarsh made overtures to Fernando Alonso, the McLaren boss admitted Mexican Perez hasn't beaten teammate Jenson Button "consistently enough" in 2013. "He is going to give it a good go this weekend I expect," he said in Singapore. 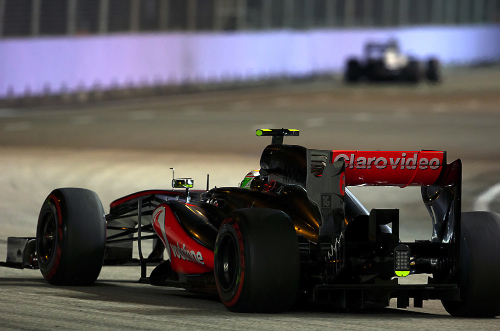 But Perez, 23, then qualified 14th, six places behind Button. "I have to say that I'm not happy with my performance at all," he admitted afterwards. "I know I have to improve and I'm working very hard with my team to improve," added Perez. While Whitmarsh has hinted McLaren will nonetheless go into the 2014 season with the same driver pairing, the Guardian newspaper reports that Perez's three-year contract actually features year-on-year 'options' in the team's favour. Another rumour in the Singapore paddock is that the question mark above Perez's name might also be related to his crucial sponsorship ties to the Mexican billionaire Carlos Slim. Asked if Perez is championship material, 2009 title winner Button answered: "I don't know. "It is very different emotionally when you are fighting for a championship. It breaks some people and others rise to it," he added. With Alonso apparently out of the running for now, McLaren also has young chargers Kevin Magnussen and Stoffel Vandoorne champing at the bit to enter F1. A more likely candidate might be Nico Hulkenberg. "Ah, another rumour," the German, also linked with a move to Lotus, told F1's official website. "I like that."